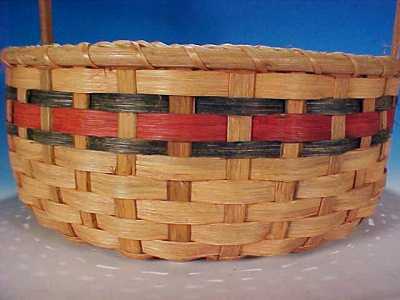 Huge (15" diameter) vintage woven MARKET STORAGE BASKET with bands of blue and red. 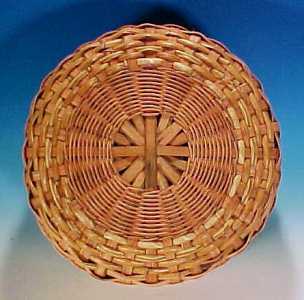 This vintage round storage basket is one of the largest I have available for sale. 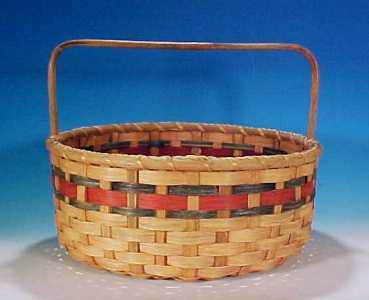 Measuring 15" in diameter, 47" in circumference, 6" high at the basket rims and 11" high at the stationary basket handle, this vintage market basket is sure to hold all of your items. Looks fabulous next to a fireplace holding fragrant pinecones. Though unmarked as to maker and date, one cane easily see that this round market basket has some age to it. Handcrafted of natural and dyed flat reed, half-oval round reed for the inside and outside rims with a strip of sweetgrass as a filler. 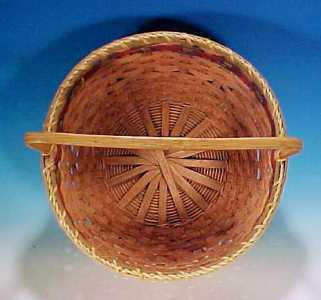 The hardwood handle is inserted down into the weaving. Very sturdy. No damage, no stains and no broken weavers.